MAARS robot is designed for reconnaissance, surveillance, and target acquisition (RSTA) to increase security at forward locations, It can be configured for non-lethal, less-lethal, and lethal effects, It weighs 369 lb (167 kg) fully loaded with sensors, weapons, and ammunition, It can use wheels rather than tracks to increase speed & reduce noise, It can be controlled over a distance of one kilometre from the operator, It is designed to tackle all terrains – including stairs. MAARS robot is the Modular Advanced Armed Robotic System, or MAARS for short, It’s an unmanned ground vehicle that can be outfitted with a medium machine gun or a grenade launcher, it is a death-dealing robot, it can drag wounded soldiers off the battlefield if they are injured to safety areas, it can pack a lot more firepower with an M134 Minigun. MAARS is an unmanned ground vehicle (UGV) that is armed with an M24OB machine gun, four M2O3 grenade launchers tubes and it can carry up to 400 rounds of ammunition, It has a 360-degree visual capability, two-way communication, night and thermal visions and the vehicle is also fitted with lasers. The Modular Advanced Armed Robotic System (MAARS) will be the successor to the armed SWORDS robot, It has a different & larger chassis than the SWORDS robot, so it has little physically in common with the SWORDS and TALON robots, However MAARS can kill, It is also designed to aid wounded soldiers by pulling them back to base, It is operated by a human, who can carry out tasks as if he is actually on site. MAARS robot is a powerful, modular and combat-ready platform, It is designed for spying, bomb disposal or load-carrying purposes, It can increase the security of personnel manning forward locations, It can be positioned in remote areas where personnel can’t monitor their security, it can carry either a direct or indirect fire weapon system. MAARS robot supports advanced computing power, self-protection features, mobility, modularity, communications, sensor payloads, safety features, power management, maintainability, and force application capabilities, it can be used in remote areas where humans are unable to travel due to safety concerns. MAARS robot machine gun needs a controller to move and fire its weapons, Sensors and cameras can transmit information to the human controller and allows him to see through the robot‘s eyes, using a lightweight wearable & control system, soldiers can activate MAARS day & night cameras, motion detectors, the acoustic microphone, the hostile fire detection system and the loudspeaker with siren, Advanced processing capabilities and an easy-to-use wearable control system make MAARS simple to operate & powerful. MAARS robot comes with multiple options, It has nonlethal lasers dazzlers and audio deterrents, less-than-lethal grenades, lethal fires from the grenade launcher or the medium machine gun, MAARS robot is battery powered, which can last 3 to 12 hours depending on mission activities, The sleep mode saves battery power allowing it to track down the enemy for about a week. MAARS robot offers measured response capability at stand-off distance, contributing to warfighter’s safety and tactical flexibility, It employs a uni-body chassis with plug-and-play design, employing a range of sensors, effectors and weapon systems, MAARS robot can project the operator’s voice through mounted loudspeakers, or alternatively to activate pulsed eye-safe green laser dazzler. MAARS robot can protect military personnel, It supports localization system, It supports active force projection, It is easy to operate, It comes with multiple safety features, It has proved high power management in the field, It can move at 7 mph, It can travel 800–1000 meters from its controller, It comes with seven cameras for driving, situational awareness, and for the weapon which can operate in the daytime or thermal modes. MAARS robot can carry four grenade rounds, The grenades contain the buckshot, sponge & tear gas for less-lethal purposes, and the explosive & airburst for lethal purposes, Each tube is loaded individually, allowing lethal and less-lethal capabilities to be available and they are selected when needed. 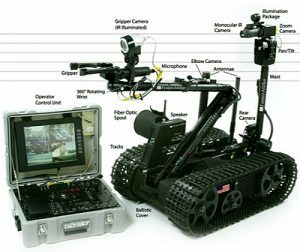 MAARS robot comes with many features such as an onboard loudspeaker to communicate, a siren, a laser dazzler, and a gunfire detection system, The weapons system can be replaced with the manipulator arm which can lift 120 lb (54 kg), making it able to pick up 155 mm artillery rounds, and it can pull over 300 lb (140 kg). MAARS can complement the 12-person infantry squad that typically carries small arms, offering up a tracked vehicle that can zone on targets with a mounted M240B machine gun firing 7.62mm NATO rounds, It can carry about 400 rounds, or it can be reconfigured to tote a 40mm grenade launcher instead, The Qinetiq-built robot only hits 7 mph for a top speed and can run from 3 to 12 hours. MAARS robot is remotely controlled, It is based on a modular framework that facilitates the addition of new accessories, It has a drop-in manipulator arm, multiple types of weapons & a wide range of sensor packages, soldiers can mount a laser on top to target enemies for precision airstrikes. MAARS robot has a non-lethal force such as a dazzling eye-safe laser or voice projection through loudspeakers that form part of a two-way communications system, It comes with many less-lethal ammunition options such as smoke, star clusters and pepper spray, MAARS robot can throw grenades and it has lasers to find targets. MAARS robot is designed to keep human fighters at a safe distance from enemy fire while successfully executing their security missions, MAARS robot wields machine guns and sets explosives, MAARS has some limitations, It’s not hands-free, since operators need to hand reload it, and it could be stopped by rougher terrain. Tags: DefenseGrenadesLethal weaponsMAARSMAARS ground robot system shipsMAARS limitationsMAARS platformMaars robotMAARS robot advantagesMAARS robot benefitsMAARS robot consMAARS robot disadvantagesMAARS robot drawbacksMAARS robot featuresMAARS robot prosMAARS robot specificationsMAARS robot usesMAARS' benafitsMAARS' featuresMAARS' importancemilitaryMilitary robotsQinetiqRemotely controlled MAARSroboticsrobotsugvUnmanned ground vehicleWhat are MAARS' features?